If you’re anything like me, you tend to become a sartorial robot in the dead of winter. Adopting a cold weather uniform’s not so bad, though...as long as your edited wardrobe is anchored with high quality pieces. Personally, I’ve become programmed to reach for different combinations of the exact same thing day after day. A crewneck cashmere sweater with dark jeans and a white sneaker. A crewneck cashmere sweater over cute leggings. A crewneck cashmere sweater...well, you get the idea. Is it lazy? Sure. It’s also luxurious, because there is simply nothing better than wrapping yourself in the softest, warmest fabric on the planet and knowing you look amazing. Cashmere is magic like that—it instantly upgrades even your simplest, most instinctive closet concoctions. So why not make this your coziest, bougiest winter yet (like me!) and devote yourself to an exclusive rotation of crewneck cashmere sweaters?! No, I’m not actually saying you must forsake all other knitwear until spring. But there are so many affordable cashmere options available to you this season—in so many unexpected colors—you might just want to anyway. I found four SG-approved, soft AF (and extremely well-priced) knits you’ll love—and because I can’t help myself, there’s one almost comically luxurious option, too. I say “almost” because let’s be real, draping yourself in the finest cashmere on earth all winter long is no joke. It’s a goddamn dream come true. Hi hello yes I am bringing up this sweater again. It’s that good! The price point is hard to beat, it comes in a ton of colors, and we stan any knitwear that is purposefully designed to look as good on you as it does on us ladies. Best of all, Naadam’s cashmere is sustainably sourced from cruelty-free goat herders in Mongolia, who hand-comb those little guys instead of shear them, which can stress them out! Remember when J.Crew’s cashmere sweaters used to cost about twice as much as this? Me too. Their website attributes the fluctuating cost to the fact that cashmere is spun all over the world, which, I mean, sure, but I’ve gotta assume they’re also feeling the heat from DTC brands muscling in on their “mass, but make it nice” business model. (Remember that thing where their CEO was let go after that bulk fabric-buying move that totally backfired?) Anyway, their struggles are your closet’s gain! I love the colorways J.Crew offers and the fact that for $10 you can get your sweater monogrammed. Neat! Everlane is one of those brands we recommend on SG when guys are looking for no-nonsense basics. Their $100 Cashmere Crew certainly qualifies for that list, but by now that’s probably a song-and-dance you’ve heard before. Instead, right now we’re eyeing their heavier by 86% crewneck cashmere because there’s just a little more goin’ on. A little more there there. This donegal knit has nice, thick ribbing around the cuffs and hem, and reminds me of something a handsome sea captain might wear while on shore leave and looking for love. 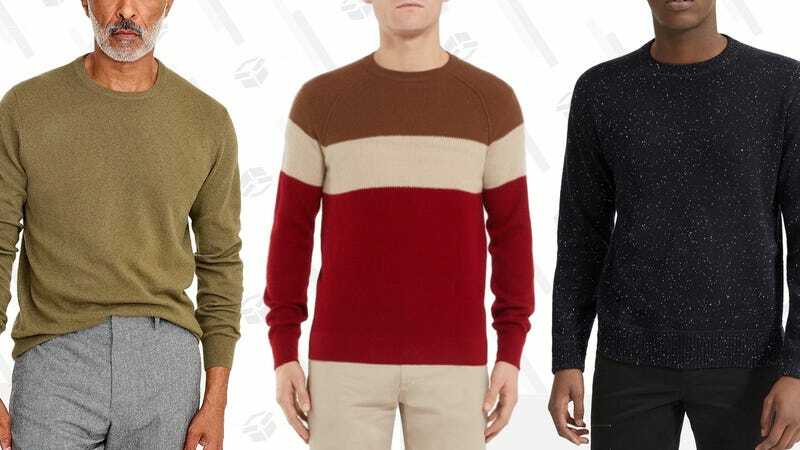 If you love the idea of a not-just-one-color cashmere sweater but can’t quite stomach an extreme luxury price point, let me point you towards this cool-tone Club Monaco knit. The icy grey and blue combination will go with all of the neutrals in your wardrobe. Don’t be afraid to pop it on over a plaid button-down shirt for a playful take on your everyday work look. Oh, sorry, did you think I was going to get through this whole thing without blessing upon you some serious Italian luxury? Loro Piana has been spinning some of the finest fabrics in the game since 1924, so you know they’re legit. This particular sweater is made from “baby cashmere” because the fibers are tapered, which (apparently) makes the yarn thinner and the feel of the sweater even softer than stupid old regular cashmere, which suddenly feels way too pedestrian for any of our baby cashmere-loving backs now, so I’m sorry. I love the color combination of this one and the textured honeycomb knit, which make it feel more special than a classic crewneck. And if you’re going to splash out with your knitwear, it damn well better be this special, right?